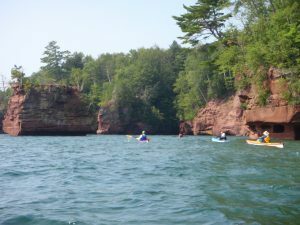 Lake Superior and the spectacular scenery around it, as seen in places like Pictured Rocks and Apostle Islands National Lakeshores, result from one of the more important processes shaping our planet – the breaking apart of continents to form new oceans. Throughout earth’s history, continents have split along rifts, long zones of volcanism and stretching, which become spreading centers along which new ocean basins form and can grow to the size of the Atlantic and Pacific. It even looks like similar rifting may have happened on other planets. Understanding how rifting works is important for both science and society, because rifting provides conditions for the deposition of hydrocarbons and other mineral resources. The problem is that when rifting succeeds in forming a new ocean, not much remains from its early stages so it’s hard to see what happened. Our studies combine seismic and magnetotelluric data being acquired by NSF’s EarthScope program with gravity and magnetic data to develop an integrated three-dimensional image of the rift system and constrain its evolution. We seek to learn more about how the rift started, how rifting proceeded, and why it ended. The video below gives an overview of the MCR, what we know about its geology, and how it affected the area’s growth.To explore these issues, I and other researchers are studying the spectacular 1.1 billion year old Mid-Continent Rift System (MCRS). The rift failed, leaving a 2000 km long belt of volcanic and sedimentary rocks left from the early rifting stage. This fossil rift, which is similar in length to the present East African and Baikal rifts, has two major arms meeting in the Lake Superior region. One extends southwestward at least as far as Oklahoma, and the other extends southeastward through Michigan to Alabama. These arms are identified using the large gravity and magnetic anomalies resulting from dense and highly magnetic igneous rocks. They are largely covered by younger sediments but outcrop near Lake Superior and along the St. Croix river (see picture above) and can be followed further south in drill cores. The seismic experiment is called SPREE (Superior Province Rifting EarthScope Experiment). For information, including pictures of the fieldwork, click here. Graduate student Miguel Merino found interesting results from modeling of the gravity data, which shows consistent patterns in magma volume between and along the rift’s two arms. The volume of magma increases towards the Lake Superior region, consistent with magma flowing away from a hotspot source there. The west arm has significantly more magma, which is not an obvious consequence of flow from a northern source, although not precluded. However, these patterns are consistent with a model in which the two rift arms acted as boundaries of a microplate between them. The volume of magma along the west arm increases with distance from the Euler pole, indicating that it acted essentially as a spreading ridge, whereas the much smaller magma volumes along the east arm are consistent with its acting as a leaky transform. These results lead us to a new view of the MCRS’s evolution. Traditionally, the MCRS is viewed as a failed rift formed by isolated midplate volcanism and extension within a stable continent. However, the MCRS appears to have been a boundary of a relatively rigid microplate within a larger rift system formed during a short extensional phase within the longer ~1.3 – 098 Ga Grenville orogeny associated with the assembly of the supercontinent of Rodinia. We thus propose that the MCRS formed as part of a larger plate boundary evolution process in which rifting succeeded. Although the MCRS arms themselves failed, they are better viewed as part of a larger system that evolved successfully into seafloor spreading. A good analogy is the way present-day continental extension in the East African Rift (EAR) and seafloor spreading in the Red Sea and Gulf of Aden form a classic three-arm rift geometry as Africa splits into Nubia, Somalia, and Arabia. GPS and earthquake data show that the opening involves several microplates between the large Nubian and Somalian plates. If the EAR does not evolve to seafloor spreading and dies, in a billion years it would appear as an isolated intracontinental failed rift similar to the MCR. 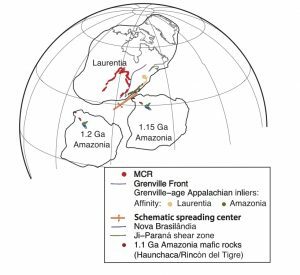 It looks like the MCRS formed as part of the rifting of Amazonia (Precambrian northeast South America) from Laurentia (Precambrian North America) and became inactive once seafloor spreading was established. A cusp in Laurentia’s apparent polar wander path near the onset of MCRS volcanism, recorded by the MCR’s volcanic rocks, likely reflects the rifting. 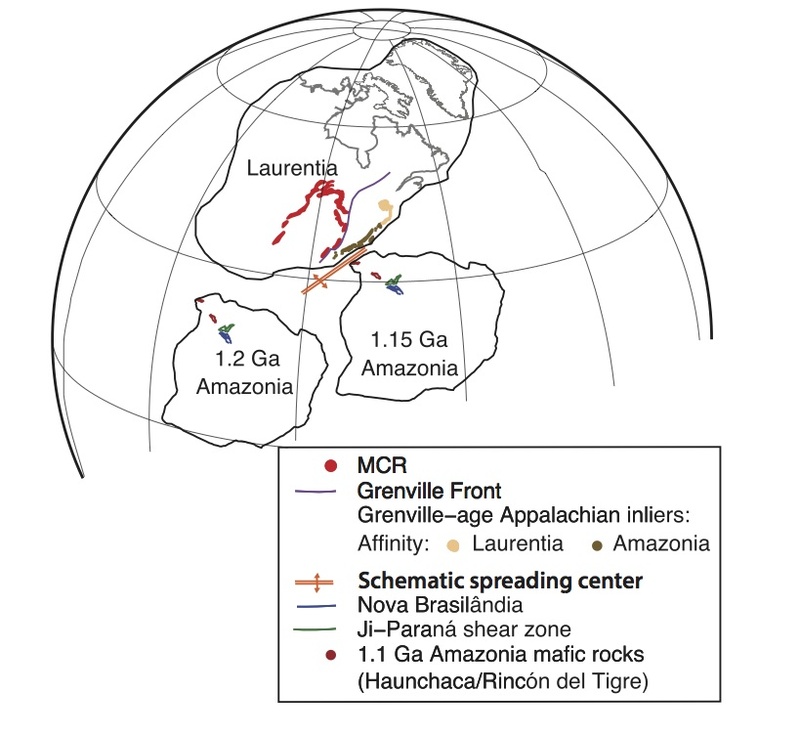 This scenario is suggested by analogy with younger rifts elsewhere and consistent with the geometry and timing of Precambrian rifting events including the MCR’s extension to southwest Alabama along the East Continent Gravity High, southern Appalachian rocks having Amazonian affinities, and recent interpretation of large igneous provinces in Amazonia. In addition to our research, we are developing material to help national and state park interpreters present the story of the midcontinent rift to park visitors, so they can see how what one sees at a site fits into an exciting regional picture spanning much of the Midwest. This effort is part of an EarthScope program for educators that held its first workshop in August 2014. Read news stories about the project from Nature or Earth magazine. A webpage about the MCR as the “LIP (Large Igneous Province) of the month” with more discussion and references here. Stein, S., C. Stein, J. Kley, R. Keller, M. Merino, E. Wolin, D. Jurdy, D. Wiens, M. Wysession, G. Al-Equabi, W. Shen, A. Frederiksen, F. Darbyshire, G. Waite, W. Rose, E. Vye, T. Rooney, R. Moucha, and E. Brown, New insights into North America’s Midcontinent Rift, EOS, 97, doi:10.1029/2016EO056659. Published on 04 August 2016 2016. Click here for EOS story with links or here for pdf. 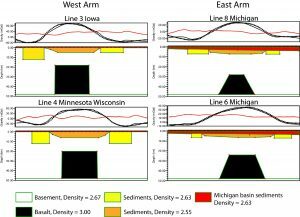 D. Malone, C. Stein, J. Craddock, J. Kley, S. Stein, and J. Malone, Maximum depositional age of the Neoproterozoic Jacobsville Sandstone, Michigan: Implications for the evolution of the Midcontinent Rift Geosphere, doi:10.1130/GES01302.1., 12, 4, 2016. For pdf click here. Stein, C. A., S. Stein, J. Kley, D. Hindle, and G.R. 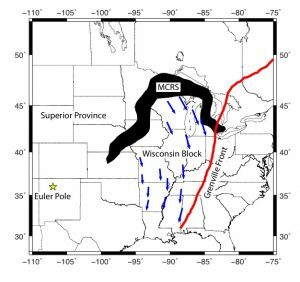 Keller, North America’s Midcontinent Rift: when rift met LIP, Geosphere, 11, 5, 1-10, 2015. For pdf click here. 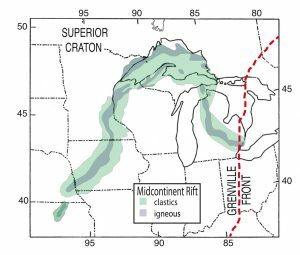 Stein, C. A., S. Stein, M. Merino, G. Randy Keller, L. M. Flesch, and D. M. Jurdy, Was the Mid-Continent Rift part of a successful seafloor-spreading episode?, Geophys. Res. Lett., 41, doi:10.1002/2013GL059176, 2014. For pdf click here. Variations in Mid-Continent Rift magma volumes consistent with microplate evolution, by M. Merino, G. R. Keller, S. Stein, and C. Stein, Geophys. Res. Lett. DOI: 10.1002/grl.50295, 2013. For pdf click here. 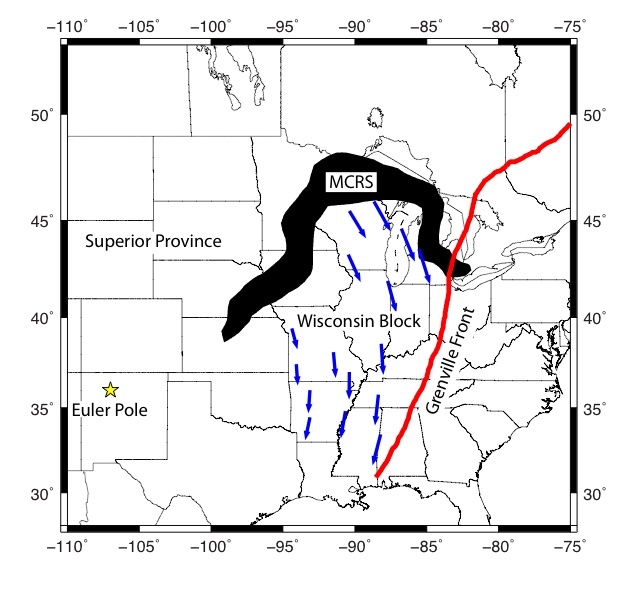 Learning from failure: the SPREE Mid-Continent Rift Experiment, by S. Stein, S. van der Lee, D. Jurdy, C. Stein, D. Wiens, M. Wysession, J. Revenaugh, A. Frederiksen, F. Darbyshire, T. Bollmann, J. Lodewyk, E. Wolin, M. Merino, and K. Tekverk, GSA Today, 21, 9, pp 5-7, September 2011. For pdf click here. Stein, C. A. et al., North America’s Midcontinent Rift: When Rift met LIP (2015 AGU meeting talk). For pdf click here. Stein, S., C. Stein, E. Blavascunas, and J. Kley, Using Lake Superior parks to explain the Midcontinent Rift, Park Science, 32,1, 19-29, 2015. Our group studying the MCRS includes Carol Stein (University of Illinois at Chicago), Randy Keller (University of Oklahoma), Jonas Kley and David Hindle (University of Gottingen), Suzan van der Lee and Donna Jurdy (Northwestern), Douglas Wiens, Michael Wysession, Ghassan Al-Equabi, and Weisen Shen (Washington University in St. Louis), Justin Revenaugh (University of Minnesota), Andrew Frederiksen (University of Manitoba), Fiona Darbyshire (University of Quebec), Lucy Flesch (Purdue University), Adam Schultz (Oregon State University), Philip Wannamaker (University of Utah), Gregory Waite and Bill Rose (Michigan Technological University), and many graduate students from the different universities.